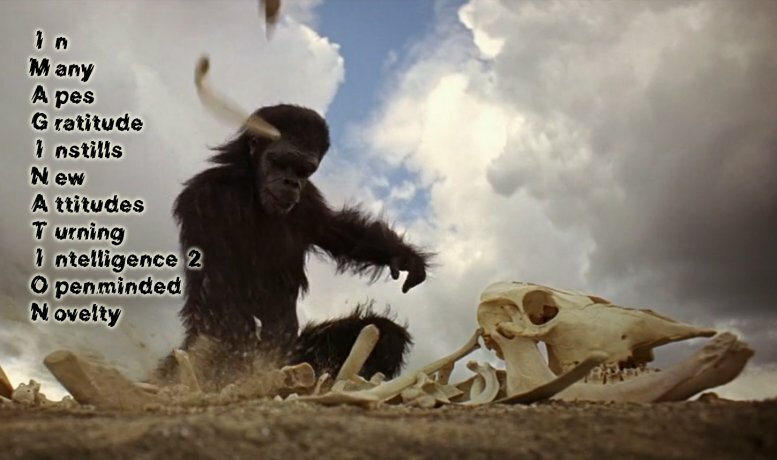 Yes, it did take the ape's imagination in Stanley Kubrick's '2001: a Space Odyssey' to turn a bone of an animal into a tool to enable it to become a hunter rather than a gatherer. And yes, that same imagination later turned the tool into a weapon to enable it to turn on its own species. Have we exceeded this level of awareness? Mostly Yes, I feel: although we humans still enjoy fiction in movies, games and books, we mostly consider killing another human as something that is 'not done'. Of course many of us still eat meat, and the scale at which this happens still kills inordinate amounts of animals, but work on synthetic meat products yields ever better quality products. Are we like HAL, in that we consider ourselves 'fool proof and incapable of error'? Some people perhaps, but mostly we try to do what we consider to be right, even when others may consider it wrong. I for one am considering vegetables alive as well, so vegetarianism or veganism is just another choice of which lives to spare and which to sacrifice. We don't deny a tiger or lion its share of meat, so why stick to vegetables ourselves, if life is everywhere?